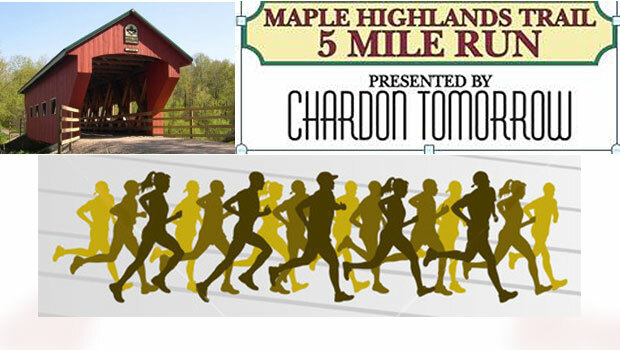 The third annual Chardon Tomorrow Maple Highlands Trail Five Mile Run will be held on Sunday, September 22. The race, which begins at 8:30 a.m., is run entirely on the flat asphalt of the Maple Highlands Trail in the Geauga Parks District. Cash prizes will be awarded to the top three finishers in the male and female divisions with additional awards for first place in each age group. In addition, the runner who lives furthest from Chardon will receive a half gallon of maple syrup. . Entrance fee is $15 for advance registration and $20 on day of race. Pre-registration is available online. Participants can register on race day from 7:00 a.m. to 8:00 a.m. at the trail entrance at 12601 Chardon- Windsor Road, just three-fourths miles east of the Chardon Square. Plenty of free parking will be available. All proceeds benefit Chardon Tomorrow, a non-profit organization dedicated to the historic preservation, promotion and economic development of Chardon. For further information contact Steve Turpin at race@chardontomorrow.org. Any Way You Spin it, the Sirna’s Have a Green Thumb!